Conforming to the title of the session, Keeping it Brief – The Art of writing Short Stories, an eminent panel of authors, navigated by moderator Altaf Tyrewala, narrated excerpts from their stories and remarked on the nature of short stories and their relevance today. The session was kicked off with Anjum Hasan , who spoke about her story Good House Keeping – one about domesticity, the relationship between a mother and a daughter, and a young girl trying to break away from the confines of her home and travel to England. A common thread that ran throughout the session was the difference between the novel and the short story and what form a short story should have. 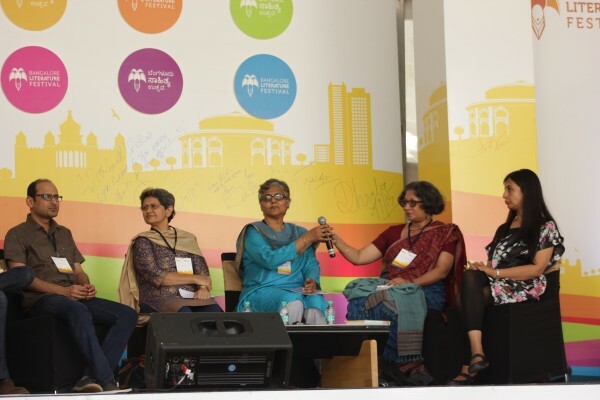 Usha KR, while commenting on the qualification of a piece of work to be a short story, noted that the spectrum of a short story bears very close affinity to a novel. It’s the nature of the experience to be narrated, which deciphers whether a story is categorised as a short story or a novel, and not the time taken to write it. Susan Visvanathan, speaking about her story Nelycinder, interpreted the space of a short story as absolute abstraction and referred to allegories from the times of St. Thomas that can be used to draw comparisons on servitude and hierarchies that still exist between the working class and the so-called bourgeoisie today. “A short story is the tip of the iceberg and the novel is hacking out a little more, but still the iceberg,” said Anjum Hasan. She added that the topic alone does not qualify a short story. The difference between the novel and a short story is that, while writing short stories, one can day dream and meander through several different stories. A novel, on the other hand, is just about one story and to do it justice, the author must concentrate on developing the depth of that singular narrative. The conversation then veered off into the revival of the short story on online forums like Amazon and other websites. The panel then considered whether branches of short stories, such as concept fiction (which is often just a paragraph), are reflective of the structured lives we live today. Perhaps the lifestyles we lead are pushing us to the brink of brevity, where attention is held for more and more brief periods of time. Palash Krishna Mehrotra, however, contended that the short story is still not a widely accepted or circulated form by most publishers. It is not enjoying any sort of revival, even though the internet is sprinkled with short stories in varied forms. Susan Visvanathan pointed out that while short stories have the ability to travel through different platforms to a diverse audience, there is still a lack of demand for short stories. Although it did not resolve this conundrum between a shift in lifestyles and a lack of investment in the commercial prominence of short stories across traditional publishing houses, Marathi author Saniya observed that short stories have always been an inherent part of Indian literature. Giving the example of Marathi literature, which has a rich heritage of short story writing, she said that that the story, unlike a novel, is very fluid, often resisting the codification into a particular framework. There is always something left unsaid in a short story – which is challenging for both the author and the reader.